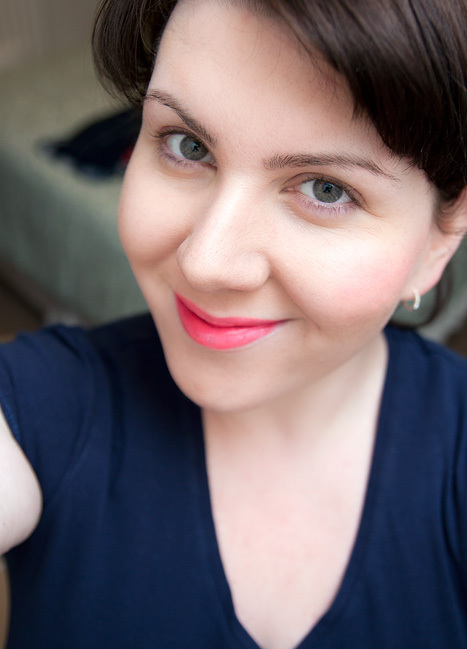 Still on the theme of warming things up a bit in hopeful anticipation of a glorious Summer, I’ve got another lovely bright lip to show you. 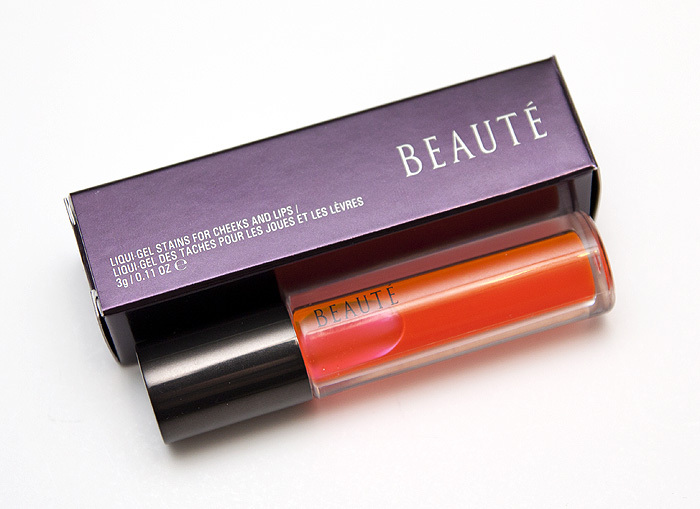 This one comes with a difference though, it’s a liqui-gel formula that can also be used as a long-lasting cheek stain. 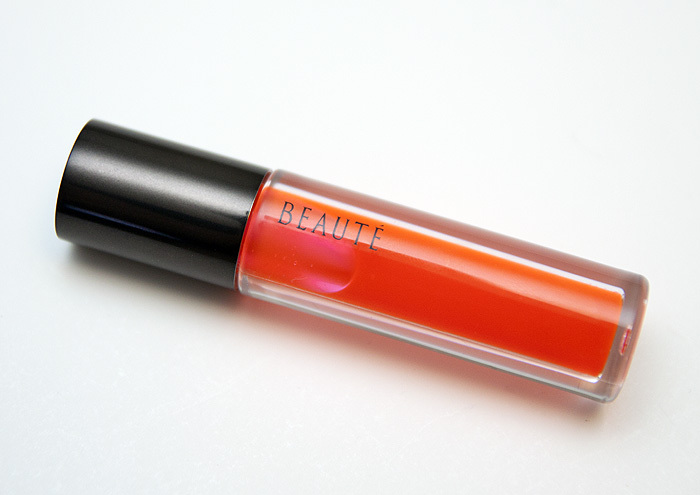 Beauté Cosmetics hail from Canada, brainchild of makeup artist Beau Nelson. The range includes lip cremes, glosses, brushes and these lovely liqui-gel stains. I already own a lip creme (which I don’t believe I’ve ever blogged about) but knew that I wanted to buy one of the liqui-gel stains after reading about them a couple of years ago on LondonMakeupGirl’s blog. How ridiculous(ly cool) does it look in the tube? I think, if I’m honest, it’s probably what attracted me in the first place. Super-neon coral with a cool pink flash? Awesome. Don’t worry though, it doesn’t apply anywhere near as scarily as it suggests it will! Once applied and blended on the lips or cheeks, it’s a really wearable warm pink – perhaps a little vibrant for some, but so very beautiful. As far as application goes, it’s pretty forgiving once you get used to the texture. It doesn’t set immediately and gives a fair amount of playtime to get things right before you’re stuck with clown cheeks for the entire day. Buildability is the key to success with this one, don’t apply a load in one go, especially on the lips or you’ll struggle getting the formula to sit well. Once the stain has set (after about a minute) you’ll be rewarded with some delicious colour that won’t budge for hours. The above photo shows Fluoron worn alone on bare lips with a little on my cheeks, I should have applied a touch more for the sake of the camera but I was wary of overdoing it. Hopefully, you can still make out the colour well enough. I don’t generally enjoy wearing stains too much but I’m making an exception for this one, or should I say… it’s made an exception for me. 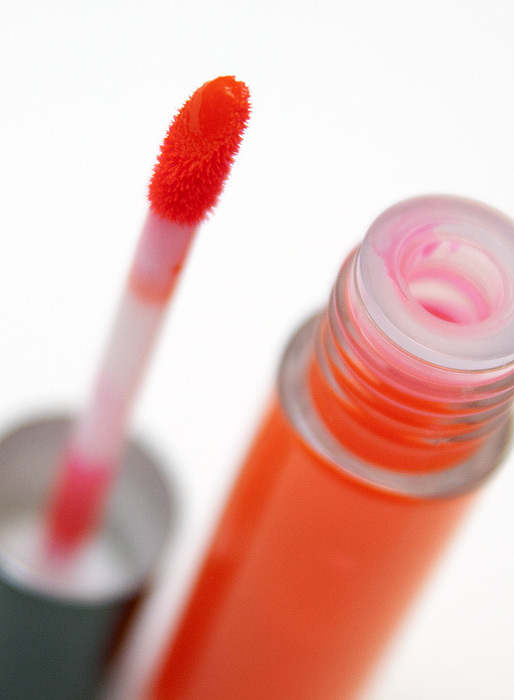 What’s your favourite lip and cheek stain? You always look so great in hot pink. I really wish I could pull it off like you! Looks fabulous on you. These are great for summer. LOVE this! I looks fab for the summer. I never managed to get past the soapy taste of it It looks so much better on you than it did on me! What a pretty summery shade! Looks great on you! I love these! 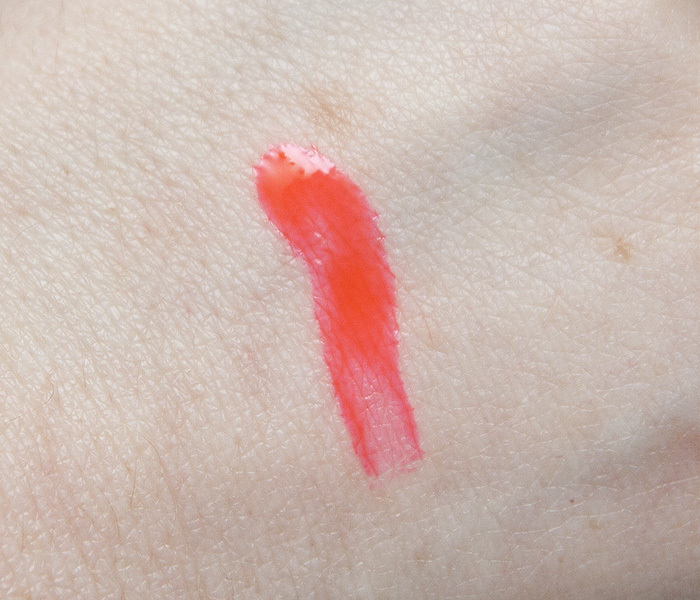 Glad to see you do too Bought this one and Neon (the orange) in Vancouver over the summer and wore them nonstop, the pigmentation is perfect and the texture was so nice. My favourite lip and cheek stain is Benefit in cha cha tango. It is also one of those shades that it’s a little scary at first glance, but once it’s blended it goes on beautiful into a nice mango. I love how it lasts too! I find with any stains on your cheeks that it’s best to put it on after your foundation and then powder because I find it sets better, and also if you accidently put too much on, the poweder helps to tone down a bit and you can also build more colour afterwards if you wish. Can this be bought online if you are not in the UK through these websites?